Whenever possible, attach price tag to the clothing tag rather than through the fabric. This minimizes damage to the garment. Tag may only be attached with a safety pin or tagging gun. The hanger should face left like a question mark. Pants should be secured to the hanger with large safety pins ONLY (no clothes pins). Do not fold pants over the hanger. 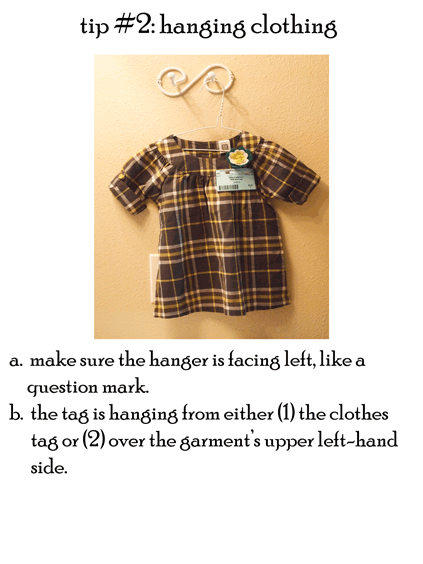 Pants should be pinned to the TOP of the hanger rather than the bottom rung. See picture. Do not place clothing in zip lock bags. Use a plastic tie to secure pairs of shoes together. Secure your tags to shoes using the plastic tie. If using a zip lock bag, place tag on outside. Tape tag on the back of the book or on the inside back cover with scotch tape or painters tap to prevent damage to the book. Do not place books in zip lock bags. If you have small toys with lots of loose pieces (ex. blocks, small cars, soldiers) put them all in a Ziploc bag. Use Ziploc Brand “Big Bags” for larger pieces, if needed. Secure the top of the bag with packing tape. Tape your tag on the outside of the bag. Do your best to SECURELY attach your price tag to the item WITHOUT DAMAGING THE ITEM. Hi, first time consignor, do we tag our items when we drop them off or print out tags beforehand? Thanks! Welcome Elizabeth! We are happy to have you join us! Please print out your tags on cardstock and tag your items before dropping them off. Your 30 minute drop off session will be very busy with us going through your items and sorting them for all our shoppers to clearly find. 🙂 Let us know if you have any other questions. See you soon! Hi, thanks for the reply. I’m having a hard time locating the printable tags on the website/consignor page. Am I missing the link? Thanks! It can be hard to find. 🙂 Log into your consignor account (if you don’t have one, register as a consignor first). On the “Consignor Homepage”, the fifth option on the lefthand column of activities says “Work with Consigned Inventory.” After clicking on that you will get to a screen with lots of options. Scroll down to see the “Print Tags” options. Let us know if you need more help! Is there a link to enter items to be tagged? Or do we make up our own tag? If so what information needs to be on the tag? Can we use children’s pant hangers for shorts & pants? I already printed my tags but I did not use card stock. Will that be ok? When grouping items together like an outfit or a few shirts/ onsies together, do you want them all on separate hangers or all pinned on the same hanger? I have some shirts and pants that go together and I am trying to figure out how to keep them grouped. thanks! Pinned on the same hanger works great! And for shirt/pant sets, hangers with clips work well for the pants and you can put the shirt over them. We got ours on Amazon. I don’t know of any local stores that sell them. But online, they are only about $10! Do we get our hangers back afterward or does the purchaser keep the hanger? The hangers go with the purchaser. Do battery powered toys need batteries in them? Yes please. Shoppers want to make sure toys work before they buy! How should I tag and prepare the following non-clothing items: a Baby Bjorn, a Seven Sling (carrier), a single basinet sheet, and a nursing cover? These types of items will go on a table with others like them. You can tag them directly with a tagging gun or safety pin. A sheet might be best in a large Baggie. Where do I find the tags to print them out? The guidelines say not to put clothing in Ziploc bags, but I thought onesies were often in Ziplocs? Can you confirm whether or not that’s ok? Thanks! Yes onesies can be in ziplocs. Some people like to hang cute ones on the racks so people can see them better. Either way works! Is colored card stock okay to print labels on or does it have to be white? I have cream color which is the closest to white I have. Cream colored will be fine. 🙂 White just reads the best on our scanner guns.